One of the things that makes Paula’s Choice Skincare special is what we call our cocktail approach to the ingredients we include in our products. By “cocktail” we mean that we don’t focus on one single ingredient—no matter how good it is for skin—to the exclusion of others. Why we take this approach has everything to do with your skin and what research has proven it needs to thrive. Simply put, skin is the largest organ of the body. Not surprisingly, its needs are many and complex—far too complex for any single ingredient, no matter how great, to address on its own. Think of it like your diet: Spinach is healthy for everyone, but if that was all you ate, your body would soon suffer because it needs more than what spinach alone provides. The same concept applies to skin: What your skin needs to look and feel healthy, younger, and more vibrant is a variety of brilliant ingredients, including antioxidants, skin-replenishing ingredients, and skin-restoring ingredients. 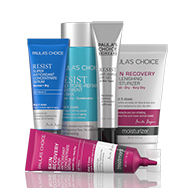 Paula’s Choice uses innovative blends, or cocktails, of these ingredient groups in all of our leave-on products, from serums to moisturizers, retinol products, exfoliants, eye creams, and more. You can be confident that Paula’s Choice Skincare products are expertly formulated to give your skin an exciting cocktail of the brilliant ingredients it needs to look and feel healthier, younger, and resilient, now and for years to come. Cheers!